One of the horrific results of war ravaged countries is the loss of cultural artifacts due to bombs and fire. During World War II, the Nazi's systematically set out to steal all the historic paintings and sculptures from museums but mostly from private collectors. 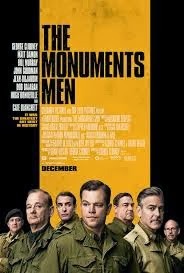 Based on the book The Monuments Men: Allied Heroes, Nazi Thieves and the Greatest Treasure Hunt in History by Dallas based author Robert M. Edsel, director George Clooney also wrote and produced with Grant Heslov this feature with some favorite and familiar movie stars. The movie based on the real life events is a throwback to the propaganda war films of the 1940's with all the patriotic speeches about how saving the art is saving who we are. George Clooney plays art conservationist Professor George L. Stout who convinces the president to save the art from the ravages of the U.S. bombing of Europe. Now, Lt. Stout must assemble a team of art scholars who can identify the most precious of the pieces to keep them out of Hitler's hands. James Rorimer (Matt Damon) is a curator with the Metropolitan Art Museum. He has to convince Claire (Cate Blanchett) to trust him as she was in charge of inventorying the art the was stolen from Paris. But she is wary of him, thinking he may be a greedy American coming to take it for his museum. The rest of the platoon is broken into teams to scout various cities and churches. Sculptor John Goodman as Sgt. Walter Garfield is with Jean Dujardin playing French design specialist Lt. Jean-Claude Clermont. Sgt. Richard Campbell (Bill Murray) is an architect is with theater director Pvt. Preston Savitz (Bob Balaban). Their point man in Europe is Major Donald Jeffries (Hugh Bonneville) who appreciates Stout giving him a second chance as he was a notorious alcoholic. They also pick up an American soldier who was born in Germany, Sam Epstein to help interpret. The movie looks good. The art direction and costumes give it a nice vintage feel for the time and place. The actors are convincing playing older men who want to serve their country and happy to be able to use their particular expertise in doing something critical but somewhat under appreciated. The team is not given support by the ground troops in place so they are basically on their own. The team suffers casualties and ponders if what they are doing is worth the cost of their lives. It's hard to make a movie about chasing art into a couple hours. To keep things interesting the story is sprinkled with humor from it's quirky characters. A sense of urgency develops when Hitler signs a Nero command that everything must be destroyed in case of his death. On top of that the Russians are coming in and plundering the art as compensation. It's an interesting footnote to the war and there have been movies made about the stolen art, maybe from not this particular perspective. There were actually about 345 men and women involved, but this movie would make it seem only seven of them saved all the art. This is a slow and uneven tale that relies mostly on the chemistry of the actors. The fact that over 5 million pieces of art were recovered is monumental feat in itself. One that deserves to be just pretty as a picture.